Also known as: Knucklehead, Cujo. Diverse palate. Eats everything except brussels sprouts and dog food. Knows the location of every dumpster and dead rat in a five-mile radius. Rigorously enforces ambitious exercise routine. Great for New Year’s resolutions! Is well-behaved on walks unless provoked by the existence of other mammals. Will enthusiastically protect home from other household pets, the ice-maker, packages, brooms, the garage door, nearby pedestrians, that weird clang the oven makes, and Grandma. Price: 50 pounds draped across your bladder every morning. Congratulations! You discovered my tipping point. I’m in a bit of a funk. I know you don’t care, but I’m telling you anyway. 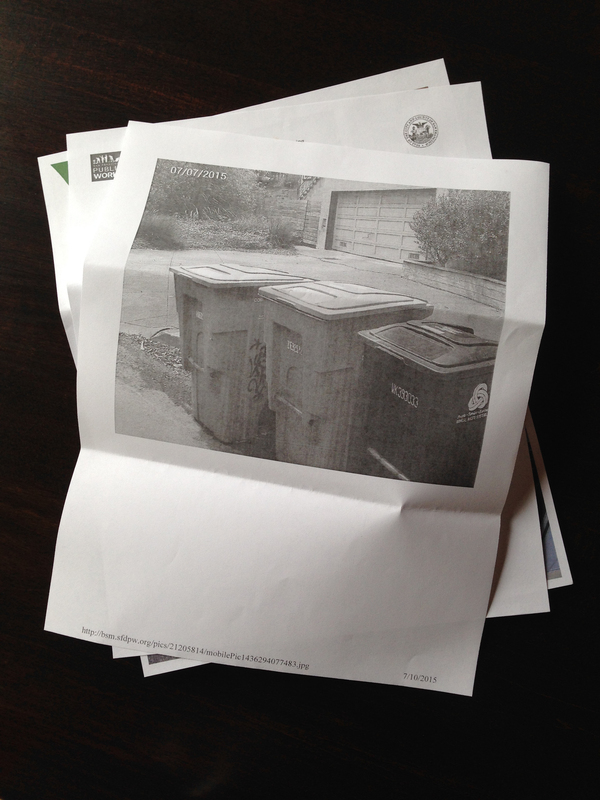 After the letter I received from city public works today, I thought we should get better acquainted. I got laryngitis right in time for my college reunion, so I got to stand around drinking seltzer, smiling and nodding like an idiot, while everyone else had the time of their lives. Then I got much, much worse. I was dismally ill through the entirety of my family’s big awesome vacation to Hawaii, including one memorable day at the Kaiser Permanente clinic there, because that’s fun. I enjoyed reading last September’s Better Homes and Gardens cover to cover as well as a thoughtful booklet about advance health care directives. That was such an informative way to squander a day in paradise. I flew home and was sick some more. A month later, despite giving up coffee, alcohol, talking, sleeping, and–especially today–joy, I’m still sick. A couple of hours ago, I had another visit with my doctor. He assures me that I will probably be feeling better by the end of July…which will be right after a big family trip across country to visit my mother. Here’s hoping the recovery comes before my husband abandons his hacking, sleepless wife. No big deal, right? Just a pesky virus. Things could obviously be much worse. Did I mention that my big, fabulous book deal just disintegrated? No? Well. My big, fabulous book deal just disintegrated. Maybe it’s for the best, you may be thinking. After all, the publisher had a penchant for the playful caveman font. Still. Add to this the fact that my best friend is apparently breaking up with me…via email. Ouch. But instead of crying in a heap about my broken heart and broken dreams, or going to bed in order to finally, actually, maybe start feeling better, I have been copyediting and photo editing and cleaning out the closets, taking small people to the eye doctor and dentist and piano lessons, and grocery shopping and saying goodbye to friends who are moving 3,000 miles away, and labeling every goddamn pair of my kids’ underpants with a Sharpie for camp. Imagine my surprise then, when I was reminded–after living in this house for almost eleven years–that I happened to forget to bring my garbage cans in. Once. I left them out there for one day. AND YOU TOOK A PICTURE AND SENT IT TO THE GODDAMN CITY so they would start harassing me. I’m sorry you were so overwhelmed by the incredible monstrosity of my tidy row of bins that you were completely unable to walk over and knock on the door like a reasonable human being and were instead forced to take a photo and print it out and mail it to the goddamn city. Guess what? I’m going to sneak over there today to cough on your mail. And maybe lick your door knob.